The large company LA Fitness has workout facilities throughout the United States. Like most chain gyms, LA Fitness has an abundance of equipment for members to improve muscular strength and endurance and to improve cardiovascular fitness. Setting up a workout program is an important step toward ensuring success. Fitness professionals are available at each facility to assist you in setting up a suitable program. You also can create your own program. Record your fitness goals on paper or on the computer. Make your goals clear, well-defined, measurable and time-oriented. Keep your goals posted on your refrigerator or at your desk to assist you in staying on track. Schedule a fitness assessment to determine your fitness level. 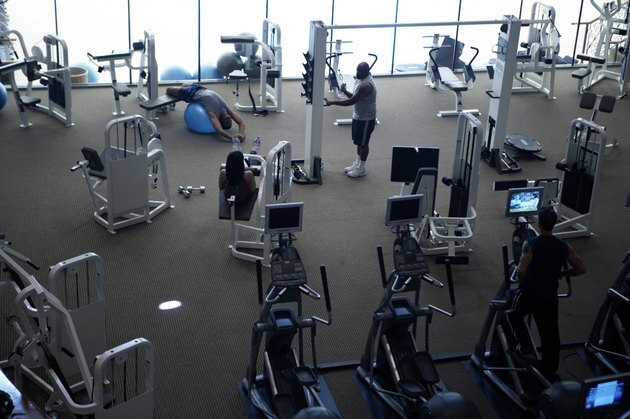 Most LA Fitness facilities offer new members a complimentary body fat and cardiovascular fitness assessment. Check with the personal training department to schedule your appointment. Walk the floor of the gym and choose the equipment you would like to use in your workout program. A good workout program includes both cardiovascular and resistance training equipment. Test fitness equipment for ease of use and locate equipment to work all major muscle groups. Each LA Fitness center has a different layout. Most locations group upper and lower body equipment together so that members can set up circuit-style workouts. If you are unfamiliar with a piece of equipment, seek assistance from an LA Fitness staff member. There is no charge to demonstrate proper use of equipment. Purchase a workout log to keep track of your workouts and progress. Plan and write out your workouts before you get to the gym to make efficient use of your time. Check your workout log weekly to determine your progress. At the end of six weeks, perform a follow-up assessment to determine how your cardiovascular and muscular fitness has progressed. If you haven't made any progress in weight or inches lost, enlist the help of an LA Fitness personal trainer or locate a registered dietitian in your area. A weight loss of 1 to 2 lbs. per week is realistic. Start your program slow and increase or change variables every three to four weeks. Check the faceplate of workout equipment for basic instructions. Seek help from a fitness professional concerning proper use of free-weight equipment. Use proper technique when lifting and when using cardiovascular equipment to decrease risk of injury.